Why had Moses disappeared many years before the Exodus? Has one of Moses' secret burial chambers to be found in Egypt? Which high-ranking Egyptian had an identity like Moses? Did Moses know about history's oldest known star map? Which documents mention how the execution of Moses was faked? New information, decoded by the help of modern astronomical methods used on the world's oldest star map - found in 1927 in secret Egyptian burial facilities, at Luxor, - presents accurate dating. This makes it possible to substantiate significant material on Moses' existence in ancient Egypt during the 18th dynasty. The book is the first to explore and develop a genuine Egyptian context with regard to Moses. Data from archaeology, Egyptian astronomical records, and ancient inscriptions as well as the Rabbinical Talmud texts show why the traditional concepts of Moses' identity and fate need to be critically revised and re-examined. The sources strongly indicate that Moses was a high-ranking leader among the Egyptian elite, and offers a master key to uncover a large-scale political intrigue at Pharaoh's court which led to Moses' exile. The "silent years" of Moses' life can now be revealed and heard. "... the results of modern research all the way up to the present have been applied and discussed to an astonishing extent. - Well-articulated, thought-provoking - it has the potential to change our present view of the historical sequence of events in the Near East in the second millennium B.C. ...". "... Concerning Ove von Spaeth's momentous, new-orientating treatise on "Dating the Oldest Egyptian Star Map", which was published in "Centaurus International Magazine on The History of Mathematics, Science, and Technology" (2000, Vol. 42:3, pp. 159-179): - a scientific pioneering work which has gained sustained admiration and respect internationally for its non-traditional observations and for finding solutions to difficult problems of key importance to ancient Egyptian astronomy and the chronological perspectives. In addition, the actual findings have furthered research on rendering more accurate the dating of Moses' historical period …"
Key Phrases concerning "The Enigmatic Son of Pharaoh's Daughter" : historical Moses drama, ancient Egypt, archaeology, anthropology, history, ancient astronomy, the Moses identity, Prince of Egypt, high priests, magical spells, identity theft, name manipulation, iconoclasm, court conspiration, ritual mock execution, royal substitute victim, star myths, astronomical dating, cultural history, chronology, the Bible, the Rabbinical Writings, religious history, theology, the Old Testament, the Torah, the Pentateuch, Jethro, the exodus, Egyptology, Ove von Spaeth, Philo, Josephus, Pharaoh's Daughter, Queen Hatshepsut, royal infant ritual, Maatkare, Isis, Pharaoh Tuthmosis III, Thebes, Sirius, World-axis, mythologies, Sinai. But the study's thoroughly argued verification precisely demonstrates that a vast multitude of archaeological and textual hints, facts and evidence can be presented and are "far greater than necessary for winning a lawsuit". For example, data from the world's oldest star map and other more recent and older finds contribute to a new perspective and to improving uncertain dating techniques. By tracing, compiling and presenting exceptional knowledge from research, finds and archives, the author produces important documents. They harbour a historically astonishing Moses account, an account that has a different, more logical context than previously assumed. A well-documented drama of reality. A drama in which the 'scapegoat' syndrome, officially used in a ritualized version, emerges in several historical circumstances. "... this re-assessment of the historical circumstances of Moses ...is not only serious, but also vivid historiography ...". "(Regarding the study of the Egyptian star map:) "... an important work for establishing Egyptian chronology ...". "... Danish author Ove von Spaeth appears to be one of Denmark's boldest scientists. - He takes a distinctive approach as a historian. Von Spaeth fills the imagination of his readers with his discoveries about Moses ...(and) has prepared a brilliant, logical solution or true stroke of genius ...". "... the book is well written and easy to read and occasionally as thrilling as a detective novel ... The reservations should not prevent anyone from reading the book with profit, especially for the sake of its literary qualities. It has the ability to captivate and occasionally to disquiet, as well! ...". "... something impressive and terrifying about Ove von Spaeth's attempt to rediscover the historical Moses. - Von Spaeth is an immensely learned man - at ease in Egyptology - he deciphers inscriptions, sculptures, calendars, historical records and much more with a brilliant breadth of view. And the result is striking. - Von Spaeth's achievements are impressive - and to a great extent convincing. The account ...is definitely thrilling and worth reading; and makes you look forward to the sequel ...". "… In his book-series, i.e. "Assassinating Moses", a Danish researcher and writer has presented what - by international standards - has to be considered sensational evidence on a connection between the history of Egypt and the existence of Moses …"
"... No researcher has previously turned his or her attention on these matters which obviously deserve a wider audience. Ove von Spaeth truly risks his neck - which a genuine researcher must be willing to do, by the way, unless he is content to be a book-keeper. One thing is certain, however: Ove von Spaeth has thrown down an impressive inter-disciplinary gauntlet that cannot be ignored ...". Even strongly interested persons at an almost-expert level have to exert themselves in order to draw immediate conclusions to all elements of such a huge collection of material as is the basis of these books on Moses ... so the strong point of these books is the very fact that so many important data hitherto neglected in research have now been included. The re-examined historical circumstances which the books on that background already have been able to present, should further inspire the scholarly branches involved to expanding this researching. ..."
Concerning a scientific treatise of Ove von Spaeth published in "Centaurus" (42;3, 2000) with documentation for the Dating of Egypt's Oldest Star Map. To be used by readers without 'professional' astronomical knowledge this was later re-edited and presented in connection with Ove von Spaeth's Moses-research. The text has been added as an Appendix to vol. 2 of Ove von Spaeth's present book-series on Moses. "... the findings are very ingenious and admirable, and quite surprising considering the apparent lack of interest of the Egyptians in this sort of astronomy. 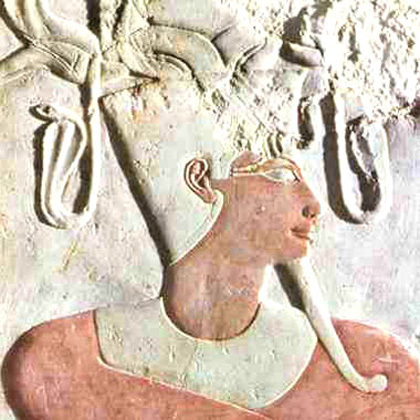 - I have visited and photographed the Senmut tomb several times, and I find it quite fascinating. Thus I find the paper especially interesting ...". "... Without any knowledge of astronomy I am nevertheless convinced that from Egyptology's point of view the paper by Mr. Ove von Spaeth contains new and valuable information concerning the date of Senmut's star map. ..."
"... this important and fascinating paper - many congratulations on the research - and it is a major advance ...". The work has been acknowledged for its language and its progression in the course of reading simultaneously with the well-documented contents. "... Among the gems I will point out: The most accurate research on Moses - www.moses-egypt.net/book-series/moses-survey_en.asp. - His English pre-translation of the first book: I have not read the latter books of his series. They have not yet been translated. I can only say that the first book is very well researched and I agree with his conclusions in the first book. Our research was independent but many of our conclusions were the same. ..."
"… Heinrich Schliemann, who proved more than a hundred years ago that the Homeric poems were based on historical facts. Just like Ove von Spaeth, who gave up his job as a printer, Schliemann discontinued his job as a merchant, in order to start finding proofs of his hypothesis. Followed by a lot of adversity and mocking, sarcasm and shake of heads from the learned people, Schliemann found his Troy. This could be one aspect for the Danish parallel to Schliemann ...". pp. 239, soft cover, DKK: 125, - illstr., facsims., geographical and celestial maps, plans.